Kifissia, Greece, 2015-4-7 — /Travel PR News/ — AEGEAN, a Star Alliance member, renewing its image and evolving the presence of its staff members, presented itsnew uniforms, designed by the renowned London-based Greek fashion designer Sophia Kokosalaki. In choosing Sophia Kokosalaki to design the company’s new uniforms, AEGEAN reaffirms its commitment to promote the work of Greeks around the world, hence highlighting the Greek nature of its operations. Throughout all aspects of its operation, AEGEAN is inspired by Greece and the characteristics of its people. A prime example is the selection of a Greek fashion designer excelling in the international fashion industry. The designs of the new uniforms combine the Greek element, promoted by AEGEAN and the fashion designer’s love for Greece, which is her point of reference in all her creations. In addition, as Sophia Kokosalaki has stated, her work is guided by the principles of ancient Greek classicism: the search for balance, and economy of line, simplicity and timelessness. Sophia Kokosalaki used these same principles not only for the dress she designed for AEGEAN’s flight attendants but also for the uniforms of pilots and Airport Ground Handling personnel. Bringing together the company’s corporate colours (deep blue, red and grey) and Kokosalaki’s designer identity, the new uniforms represent more than just a new look, signalling the start of a new chapter for the company. The new uniforms and accessories are practical, allowing easy movement while working, while being stylish and elegant. 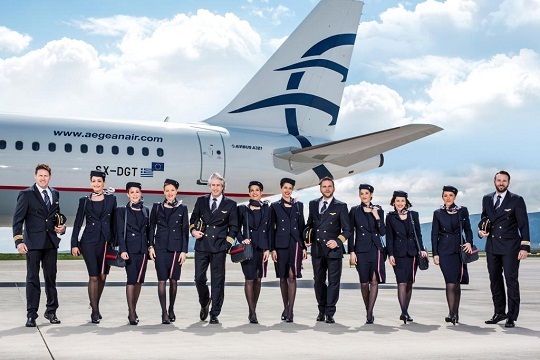 From April 1st, 2015, AEGEAN’s Pilots, Cabin Crew Members and Airport Ground Handling Personnel welcome passengers in their new uniforms, maintaining the company’s tradition with regard to aesthetic quality and Greek character while renewing the company’s presence before, during and after the flights. This entry was posted in Airlines, Airports, Flights, Transportation, Travel, Travel Management, Travel Services and tagged AEGEAN, London-based Greek fashion designer, Mr. Dimitris Gerogiannis, new uniforms, Sophia Kokosalaki. Bookmark the permalink.